Wednesday's schedule for the World ARC 2015 fleet in Saint Lucia was packed with briefings about the Rally so that crews could learn more about their exciting year ahead. The team from World Cruising Club talked through final preparations and advice as the countdown to the start on Saturday continues. 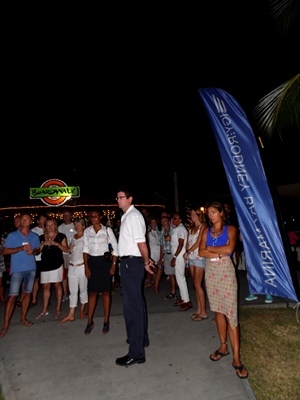 But when all the work was done, crews were invited by the management team of IGY Rodney Bay Marina to Welcome Drinks. The evening drinks reception was a pleasant end to an informative day of briefings and seminars. Crews attended the Rally Briefing to learn more about how the Rally operates followed by the Rally route briefing to learn more about the exciting months ahead. Chris Tibbs began the afternoon sessions with a look at where to find weather on the World ARC route and what are the weather considerations and patterns at each stage. He ended the day with a seminar on downwind sailing techniques. With such a busy day on Wednesday, Thursday’s programme is a lot lighter, allowing crews to complete their own preparations onboard such as provision and resolving last minute equipment issues. That said, several crews joined in the Hash House Harrier event at breakfast time and another group went off to Dennery, on the other side of Saint Lucia, to go zip-lining through Saint Lucia’s rainforest. There’ll be another morning of briefings tomorrow, including the Skippers Briefing for Leg 1, before a Farewell Party, hosted by Saint Lucia Tourist Board, in the evening.